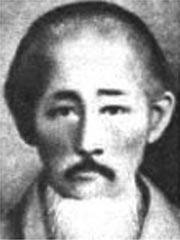 Higashionna Kanryo (also pronounced Higaonna) was taught Monk Fist Boxing by Seisho Arageki, he travelled to China in 1870 and was a student of Xie Zhonhxiang (also known as RuRuKo). Xie was the founder of Whooping Crane Gongfu. Tode, as a fighting form was used by the upper classes, 'Te' (Hand) was the name known by in Okinawa and had three types, named after the villages used in: Tomari-te, Naha-te and Shuri-te. Living in Naha Higashionna taught his methods, combined with Naha-te at the Naha Commercial High School. He was a hard task master, yet in his everyday life he was a quiet and humble man. One of his students (and his successor) was Miyagi Chojun, who became the founder of Goju-Ryu.